A new acquisition, a pair of antique platinum and yellow gold Old Mine Cut diamond dangle earrings halo’ed by 40 tiny step cut calibrated rubies and a second row of 44 tiny Old European Cut diamonds. The two main Old Mine Cut diamonds are estimated at approximately 2½ carats total weight. Their respective weights were based on their measurements 6.10x6.10x4.00mm. Additionally, the earring are being held by a pair of 0.60 carat total weight Old European Cut diamonds. Based on our estimation (mounted earrings), we conservatively *estimate the quality of the Old Mine Cut diamond at near colorless (IJ color) mildly noticeable in the profile view only and nice eye-clean SI1 clarity. We find the diamond was cut to correct proportions justifying the bright appearance and beautiful play of light these antique diamonds display. Total weight diamonds & rubies: 4.34 carats approximately. *Based on the mounted jewels. A short video of the antique platinum and gold Old Mine Cut diamond dangle earrings which we posted a few days ago. The two center Old Mine Cut diamonds are estimated at a total weight of 2½ carats. Video by H.C.'s request. These earrings will be posted on our website soon. 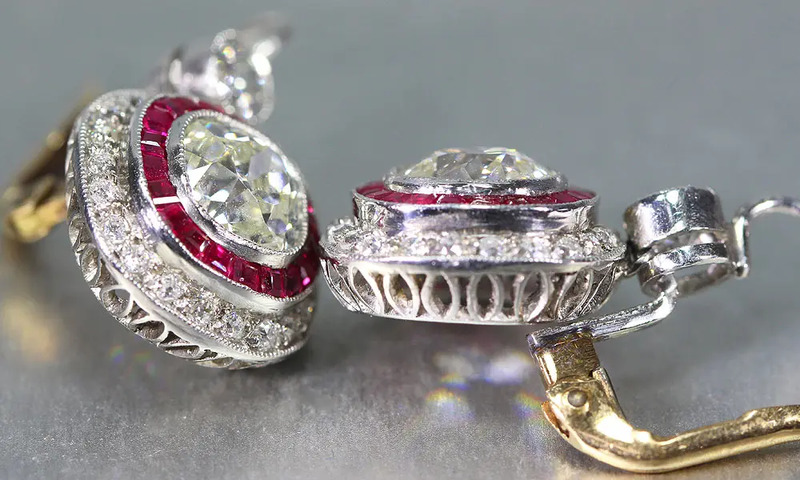 #antiquediamondearrings #forsale #oldminecut #antiquediamond #kozibe #beplatinum #vintagediamondearrings #oldminecushion #antiquejewelry #gemconcepts #antique #newyork #beverlyhills #hongkong #singapore #geneva #rarecollectiblejewels #Diamonds #oldcutdiamond #rubies.